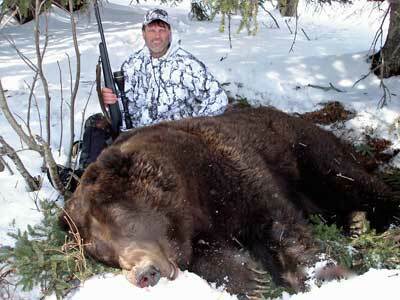 Top Gun Treks guided brown bear hunters experienced 100% success in 2006! We had 7 brown bear hunters that took 5 nice bears; 4 spring brown bears, and 1 fall grizzly bear. 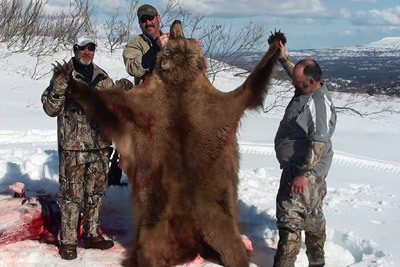 Our Brown bear hunting guides know how to get you on bears. References are available upon request. Nothing can make your heart pound and adrenaline flow like being 13 yards from a nine foot Alaska Brown Bear! 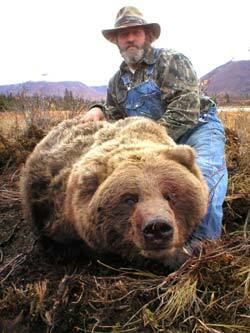 In the April of 2006, hunter Dan Gabriel and guide Robert Jewett put a 5 1/2 hour stalk on this bear (pictured left). They hiked on snowshoes and closed in to just 39 feet before making the shot. It was an Alaska brown bear hunting trip that neither of them will ever forget. Our guides hunt spring brown bears from April 1 and continue through the end of May. Hunting brown bears at this time of year is both exciting and beautiful. Snow covered mountains, glaciers, and Alaska’s grandeur is booming in the spring when the day light hours are long and pristine white landscape surrounds you. If a single species guided brown bear hunt is your focus, we recommend the spring hunt. For these hunts we travel from our meeting point to one of our camps in a ski-equipped airplane. From there we spot and stalk feeding bears or watch den areas. Brown bears come out of the dens looking for food after winter hibernation when the snow is still on the ground. Bears are easier to spot because the ground is white and the leaves and vegetation have not yet begun to grow. For all Alaska bear hunting trips, hunters should be in good physical condition and be able to walk several miles on snowshoes and do some moderate uphill hiking. For details please call us and we would be happy to discuss these details with you. Due to the fact that these bears are feeding on salmon along rivers most of our travel will be done in jet powered riverboats or in rafts. We offer these trips as hunting / fishing combination packages where we spend the early morning and late evening hours hunting bears and our mid day hours catching trophy Alaskan rainbow trout and salmon. 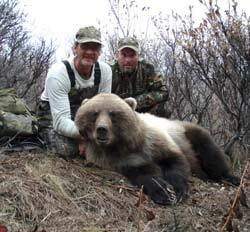 On one of our guided hunts in 2014, a pair of our hunters saw 40 brown bears on a 10 day float hunt. Our offer fall grizzly hunts beginning September 1 until the bears go in the den for the winter in late October. Grizzlies are hunted primarily inland and we recommend these hunts be done in combination with moose, sheep, and caribou hunts. We’ll fly you to one of our remote tent camps, from which all hunting is done by walking from camp and glassing. This time of year we use the spot-n-stalk method almost exclusively. Mountain grizzlies are fewer and farther between than the brown bears that are concentrated on fish. These bears roam large amounts of territory looking for food. In the spring we find them coming out of dens or along river bottoms and in the fall they are often found eating berries on the hillsides. Alaska Brown Bear Hunting – Brown Bear vs. Grizzly Bear? We’ve all heard these names, sometimes used synonymously for the same animal. What is the difference between a “brownie” and a “grizzly”, if any? 1) It is widely accepted in the guiding industry that browns live along the coastal regions, within 50 miles of the shoreline. 2) Grizzlies live in the interior regions of the state, or north of the 62nd parallel. **Brown & grizzly are genetically the same animal. Brown bears grow physically larger, primarily because they live in a milder climate & eat salmon all summer. In any case we hunt them both.